Tliab is the first Palestinian-American woman and one of the first two Muslim women elected to Congress. She supports the Boycott Divestment and Sanctions movement, which advocates for the boycott of Israeli organizations and companies to support Palestinian interests. Rep. Ilhan Omar (D., Minn.) is the only other member of Congress to support BDS, but she has not spoken on a trip to the West Bank. 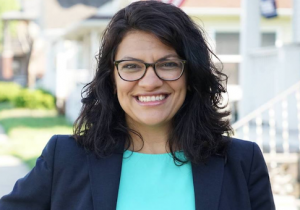 Recently, Tlaib has come under fire for her ties to accused anti-Semitic leaders, including Palestinian activist Maher Abdel-qader, who organized campaign events for Tlaib. Abdel-qader has frequently denied the Holocaust and suggested Israel is committing a Holocaust of its own. He has helped organize and appeared at a number of events with Tlaib.